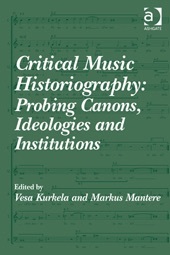 My new book chapter, ‘Gesualdo in the Twentieth Century’, has now been published in Critical Music Historiography: Probing Canons, Ideologies and Institutions and is available from Ashgate. It is based on a 2011 conference paper I gave at the Radical Music History symposium at the Sibelius Academy in Helsinki. View on Ashgate’s website here.